Thanks for your loyalty to our products! 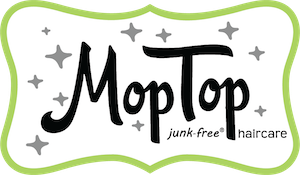 Yes, many of our MopTop products from both our Salon grade line and our Natural, Junk-Free line contain glycerin as an ingredient. Glycerin is a humectant for retaining moisture and allows the product to slide more easily. It is a necessary element in our Curly Hair Custard formula and one of the many ingredients that makes it so amazing for our hair and made it a must have styling tool for so many of our customers.